Visit Day is a favorite for both current and future Monarchs and is open to 7th and 8th graders interested in attending Mater Dei High School. Public, private, home-schooled, and Catholic schools students are welcomed and encouraged to attend. 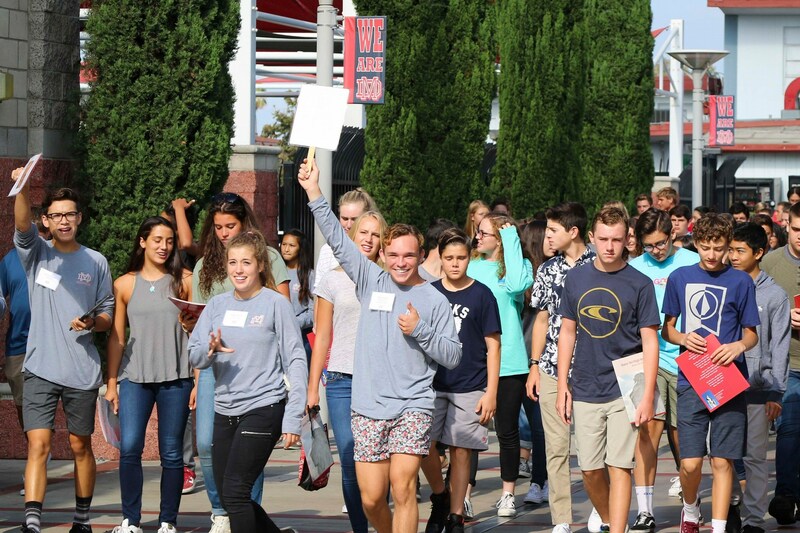 Visit Day is a great opportunity to see Mater Dei's campus and experience our school through the words and actions of our students. Following a student-led tour of campus, you will attend a presentation featuring student speakers on academics, athletics, campus ministry, and student life. Student performances from band, dance, pep squad, choir and our theatre program will also give prospective students and their families an idea of all that Mater Dei has to offer. Many schools (especially Orange Diocesan Schools) attend Visit Day as a group. However, individual attendees are welcome to attend, but must be accompanied by a parent or adult chaperone. We suggest you check with your child's school before making an individual reservation. To register as an individual attendee, please CLICK HERE. Kindly e-mail questions or concerns about Visit Day to Jennifer Hornbuckle '03, Director of Admissions Marketing.